21/34 Barrikadnaya Street, building 3, Moscow (tel. : +7 495 545-05-05), Metro stations: "Krasnopresnenskaya", "Barrikadnaya". 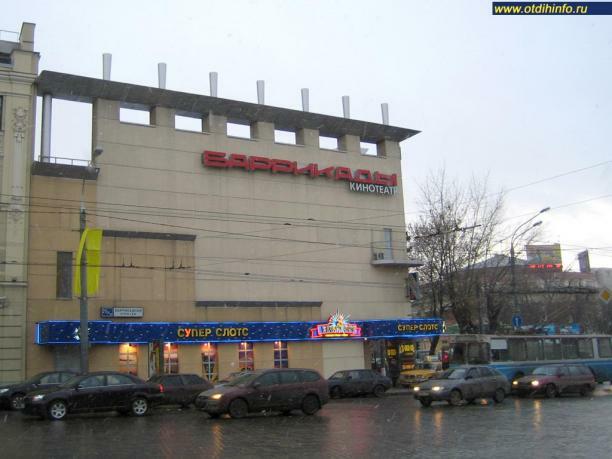 The children's Barrikady Cinema (the Cinema, for short) is one of the most legendary Moscow cinemas. The building of the Cinema used to be a vivid example of architecture of a past epoch, that of the Soviet modern architecture of the 1930s. The Cinema was always one of the most favourite places for recreation. The Cinema used to host many children's film festivals, exhibitions, shows that featured intellectuals of art; and it used to house a museum of animation puppets. This Cinema was the first in the USSR to start introduce spectators to the Japan animation culture of manga in the 1970s. During the long "post-perestroika" time (the 1990s), the Cinema fell to decay. Finally, in October of 2002, restoration works on the Cinema started; the works took into consideration the surrounding architectural landscape, the former appearance of the Cinema and the requirements to building redesign works in the Moscow's historic centre. "When developing the project, I had in mind Stalin's skyscraper on Vosstaniya Square and tried to create a kind of podium for it," said the architect Aleksey Bavykin, the author of the project. The new interior design reconstructs the atmosphere of the "old" Cinema. On the ground floor, box offices are situated. On the first floor, there is a "cinema-cafe" that offers a large selection of cold drinks and snacks. By the "cinema-cafe", there is an entrance to a small auditorium that seats 206 people; the auditorium features wide and soft chairs, modern projection equipment and DOLBY DIGITAL Surround EX sound.